What you see is what you get- no fakery here. I'm still couponing, but it sure feels like the value of coupons aren't what they used to be, and it's been harder to find good deals on items. I get the feeling with all these super couponing shows out there and some of those savvy shoppers that buy 100 identical items and pay two cents total for it, companies are being a little more cautious with the coupons they give out. Coupons used to have a long grace period to use them, expiring 6 months from issue, but now it feels like you barely get a month before they expire. I've even seen coupons that give you a week to use them, which really bites when there's a mad rush from thousands of other people trying to use the same coupon and clearing out the shelves. By the time they restock, your coupon has expired. Getting a rain check doesn't always work as not every store will honor an expired coupon or even offer a rain check on a particular deal. Anyway, that said, it's been a long while since I've been able to take a $100 grocery bill and bring it down to $20. Our pantry isn't packed to the gills anymore, and there's no more overflow stashed in the basement. I still get a good deal now and then, but nothing to write home about. Until today! I'm pretty stoked about todays coupon deal and I just had to share! The 7/6 weekend's paper had the P&G coupon inserts and there was a Buy One Get One Free coupon for the new Tide Oxi soap. We happened to go out that day but by the time I got to the stores, the Tide Oxi was cleared out. I didn't worry, the coupons expires on 7/20 (see, 2 weeks! ), and I figured I'd be able to hit the stores at least a couple more times before the coupon expired. Fast forward a week, and I never did go back out to town. 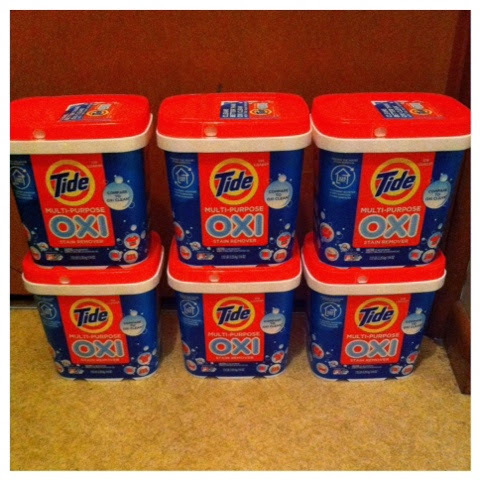 It all worked out, though, because Sunday 7/13's paper had a sale at Target advertising buy 3 Tide Oxi at $10 each and get a $10 gift card back. I did the math and I needed to buy 6 tubs to get the best maximum deal and use 3 coupons. I just so happened to have 3 coupons! (We buy 2 different papers and the 3rd came from my Aunt). The challenge was getting to Target and finding the shelves stocked, with at least 6 tubs for me! I woke up early this morning and planned to be at the doors when Target opened at 8am. I made a beeline to the soaps to discover... empty shelves. Drat! I flagged down a nice employee and asked if there were more in stock and lucky for me, they were unloading the truck right at that moment!! She was kind enough to go back and bring back some boxes and I got my 6 tubs! Happy day!! Pay $25 and get 2 $10 gift cards back = $5 for 6 tubs!! That's 83 cents a tub!! I am thrilled!! And even more so that it wasn't a wasted effort to get up so early and make the drive into town and not coming home empty-handed. I'm not a morning person-- my usual wake up time is 9ish, so I mean business when I actually leave the house at 7am to shop! 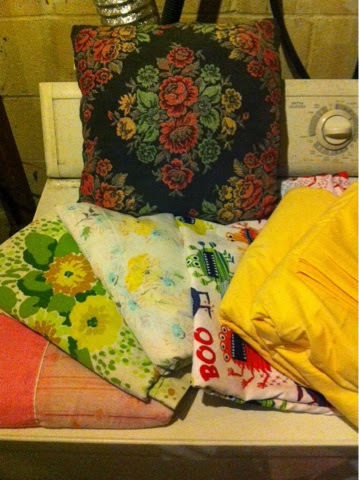 I use a lot of oxi type soaps when I wash my vintage linens and they really work to help get rid of any stains or yellowing in the fabrics and that "old people" smell. Plus I've got 4 kids, and chickens and cats... we can get some clothes seriously dirty in this house! I won't need to buy any oxi soaps for a good long time!! With 1 dog, 5 cats, 18 (I think) chickens, Andrew and I often remark that we have plenty of animals to care for. 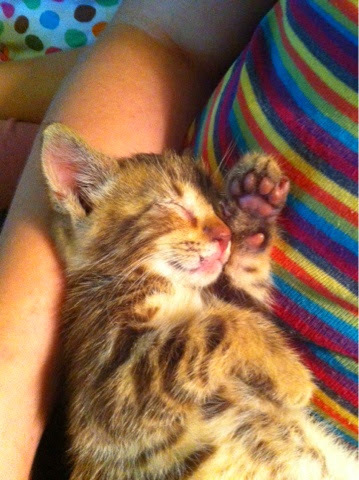 Sometimes we ohh and ahh over a certain breed of puppy, or someone posts a kitten picture that tugs on my heartstrings, but usually we cannot be swayed. It costs quite a bit of money, after all, to care for all these animals. We were also recently talking about how nice it was there were no more babies to take care of, especially when 6 out of 7 of us came down with food poisoning and there were a few days when Andrew and I could barely get out of bed. Had there been babies to care for, it would have been extra tough when we needed to recuperate ourselves. And there's the jinx. See the little baby below? Andrew was on his way home from running errands when he spots this little guy on the road. A busy country road that people zoom down at speeds of 55 and up! As fast as he could, he braked, backed-up, and parked in someone's driveway to rescue the kitty. Before he got there, however, a speedy white car comes zooming and Andrew said a quick prayer that Kitty doesn't move and he closed his eyes, hoping he wouldn't have to open them to see something that couldn't be unseen. Lucky Kitty, the car missed him and the force of the air from the car tumbled the little guy right off the road. Now safely in Andrew's arms, the Kitty meowed and meowed. His eyes were crusted shut and poor thing was so scared. Andrew comforted him and drove home with the kitty. As you can probably imagine what happened next, we all oohed and ahhed over the kitty. Poor little fella. I pureed up some canned cat food and he gobbled it down. We looked him over and except for his eyes, he seemed to be alright. 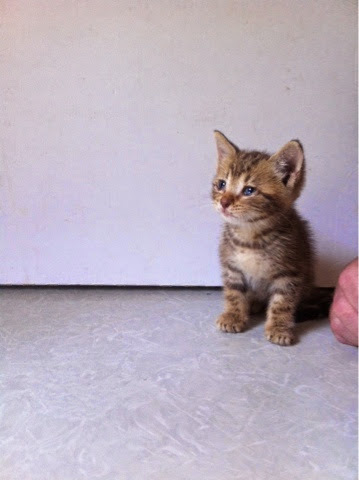 We think maybe he is 6 weeks old. As quickly as he entered our lives, we have fallen in love with him. 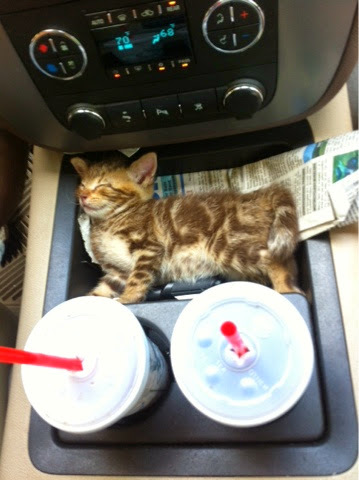 We took Kitty to the vet and he checked out just fine. Got some eye drops, some deworming meds and ointment for his paw. Heart and temps are good. Just a really cute and lucky little fellow. We haven't come up with a name for him yet-- waiting to see what his personality is like before we settle, though there are some potential names we all like. I'm reminded of what it's like to have a baby in the house, feeding him every two hours and making sure he's been brought to the litter box to do his business. Late nights and early mornings and me dragging my feet-- yup, there's a baby in the house! But it's ok, I know -this- baby will grow pretty quickly! Welcome to the crazy house, baby!! Whatever happened to the 'lazy days of summer'? Were they ever really lazy for parents? I remember as a kid and as a teenager, long days spent at the pool, or looking for tadpoles in the creeks, or imagining adventures in the nearby woods. But what did my parents do? Dad worked and Mom took care of the home. Definitely not lazy for them. For Andrew and I, there's always something to be done and it's easy to let these days fly by without taking the time to do things together as a family. So we are consciously trying to make every effort to partake in some of those lazy days of summer. Sounds contradictory, planning for a lazy day in the middle of a busy week, but if we didn't, it would never happen. One lovely destination for those lazy days is the river nearby. We discovered it accidentally last summer. Well, we knew the river was there, but didn't know we could swim in it, until we went yard sailing and took the back way home on a 4th of July weekend when all the campers were out in force. We saw kayakers and tubers, people swimming and fishing! Wow!! We never knew!! We waited until after the holiday, after most of the campers had gone home, and investigated. Sure enough, we found a river access spot close to home. It was the perfect swimming hole! Not too deep, maybe chest high in some areas, and not too fast-flowing when it hasn't rained in a few days. We went to the river quite a few times last summer, before it got cold. 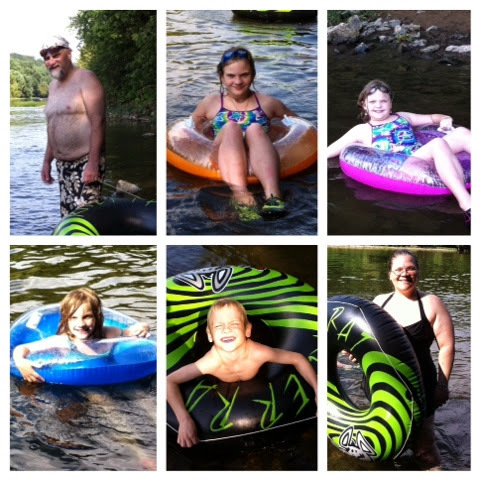 This year, we had a very rainy Spring, and the very first hot day we had, the kids begged to go to the river. It was swollen with the rains, muddy, and just too dangerous for our little ones. I wouldn't even trust myself in that river, as there were plenty of sticks and limbs floating past quickly. We waited a few more days and finally, the first week of June, we were able to dip in and swim! We've tried to go back at least once a week, more if we can fit it in. We got new tubes to float around in! So much fun!! Heyyy, I do exist!! A rare picture of Humanus Motherus!! It's sweltering here, and with not wanting to turn on the a/c, the kids are melting. It's not so bad really, but they play hard which means they just can't cool down fast enough. 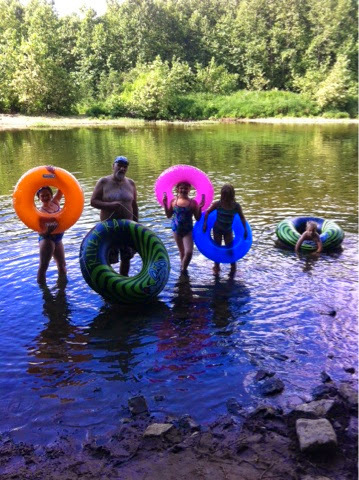 So after Daddy came home from errands, he offered to take them to the river again! It's shark week for me, so I took a pass and went into town instead. It's Peter's 6th birthday tomorrow, so I had a few things I needed to pick up. Stopped at the local thrift store and I gotta tell you, it was very nice not to rush around looking at things rather quickly because I have all the kids with me. I can't remember the last time I went out all by myself! It was a nice little hour to myself. Turned out to be a good day to hit the thrifts as I found a bunch of linens. Not all vintage, the last two on the right are fairly new, but I couldn't resist the Monsters and the yellow is a complete Queen Ralph Lauren set! Back in my working days, I splurged on several Ralph Lauren sheets, because vintage queen sheets are hard to find and I was swayed by the Ralph Lauren brand, back in that short period when brands mattered to me. Still, though, despite the brand name, I can attest to their quality, and they're not cheap. I still have the sheets I bought 20 years ago and they are still thick and super soft to sleep on. I like to mix in my newer sheets with the vintage sheets. I don't normally buy pillows, but this one caught my eye. Plus it was only 99 cents. I'm going to replace the stuffed pillow inside-- it's that old, loose foam contained in a small pillow form. Probably won't put it on the couch just yet-- the kids are still in the habit of pulling off the blankets or sheets I put on there and I get frustrated to see them end up on the floor less than an hour after putting it on the couch. With all the pet hair created by 4 cats and a dog, anything that ends up on the floor gets washed. I'll just wash the cover and put it away until the day comes when I can trust the kids not to pull stuff onto the floor. Peter turns 6 tomorrow! I still remember clearly the day he was born, how can he be 6 already? I need to finish wrapping gifts and get the party banner up, so on that note, Ta-ta! Thrifting is hit or miss these days. I hardly ever find any Pyrex at my local thrift shop because the manager there takes them all before they even get to hit the shelves! I know this because a friend of mine started working there and I asked him to keep an eye out for me. That's when I found out why I never find any Pyrex there, she hoards them all!! When I go to the big town, I try to stop at the thrift shops there, and there are many in one small area of town, which conveniently is on my route downtown. There are 2 big national shops, 3 local shops, and a bunch of consignment shops all within 10 miles of each other. My problem is I can never get there early enough to find the good stuff, because I just am not an early bird. I don't usually get out of the house until after 10 am! Anyway, we had a pretty good day yesterday at the thrifts. Andrew found some HO trains and a display car and I found a Pyrex lid at one shop. 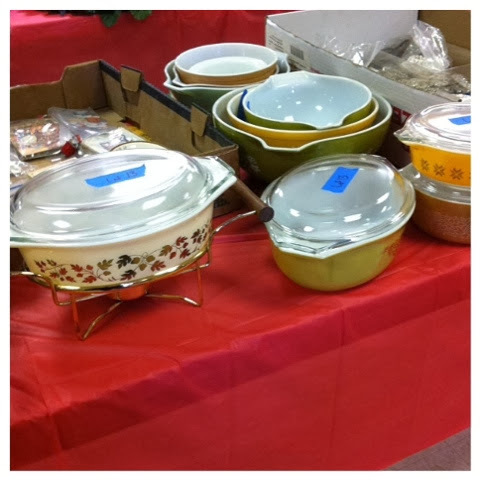 Even better at the next shop when sitting pretty on a shelf was a pristine yellow primary Pyrex bowl, the biggest one! It was nice and shiny and hardly any wear to it and priced at $6.99. I have this theory that if I grab a cart walking in the store, I never find anything. Go in without a cart and boom, boom, boom, my arms are full! 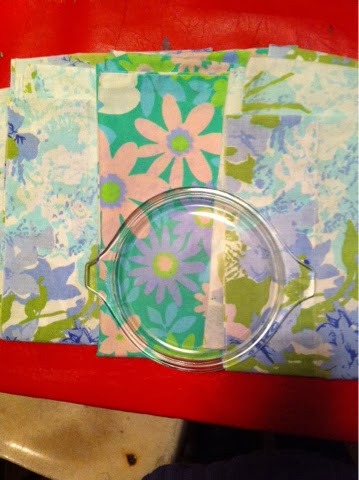 Such was the case this time-- the Pyrex, a pretty turquoise pot, and some vintage pillowcases. Don't see a yellow bowl up there, do you? I put the turquoise pot back because it was an aluminum pot and quite honestly, I'd never use it, even though it was so shiny and pretty. As for the yellow bowl, well, there's one less primary yellow bowl in this world because of me. So sad. I set it down on some white thing so I could get a better look at the pillowcases I was looking at, and then all of a sudden I hear a crash, which was so loud and I look down and there, shattered on the concrete floor, is my bowl!! Two thoughts flashed through my mind-- "wahhhh! My bowl!!!" and "Crap! I'm going to have to pay for it!" Lucky for me, there was a worker standing nearby who witnessed the whole thing and walked over to me and said, "Don't worry about it." I apologized and started picking up all the big pieces and used my foot to scoop over the tiny shards when the guy came back with a broom and dust pan. We worked together cleaning up the mess and I said, "Guess I'm going to have to go and pay for it now," and the guy goes, "Nah, don't worry about it!" He made a little joke, I guess to make me feel better and I walked away with just the pillowcases. I'm glad I didn't have to pay for a broken bowl, but I'm so sad to have broken it. Heading to the little town tomorrow to run a few errands and we'll stop at the local thrift shop. Fingers crossed I find a Pyrex bowl and I don't drop it this time! Living in West Virginia means yard sales and flea markets taper off in October. There might be one or two odd yard sales here or there, but it's pretty much done with by then. So I rely on auctions and thrift stores for my treasure-hunting fix. I was looking forward to an estate auction back in December, but it got snowed out and postponed all the way to April! It's been weeks since I've found anything good at the thrift stores, just little items now and then, but nothing big that fills up my car and makes me do a happy dance like a football player doing the touchdown boogie! Finally, an auction was advertised in our local paper and it wasn't too far. Let's go, let's go, I plead with my husband! I don't have to beg too hard, he wants to go, too! There were some old toy cars and a bunch of Pyrex we had our eyes on and maybe a few other things if the price didn't go too high. It was held at a fire station and the turnout was pretty good. 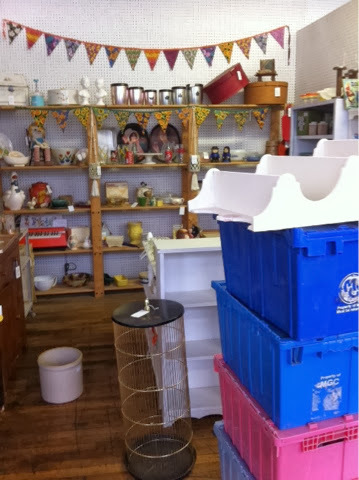 I think other people are wishing for yard sale season to start up again, too! After the tools and outdoor stuff was over with, a lot of people left, so I thought I had a pretty good chance getting what we wanted, but here's where I learned something new: This was a consignment auction. So what does that mean? It means that unlike an estate sale where the auction company can't be bothered to auction off every little item and instead group things into lots and you get the whole box for one low price, a consignment auction is someone using the auction company to sell an item for them and most times, it has a reserve price. And stuff that I thought were being sold in lots because they were grouped in a box? Wrong! It was just easier for the helpers to bring them to the front and then hold up every single item to be bid on. Holy cow!! That auction took forever!! It was moving swiftly and yet slowly because of the amount of items to be auctioned off. Thank goodness for iphones to play on! They finally got to the section where the small goods were located at, but it was still a long way off before they reached the cars and Pyrex. Cars went for way more than we were willing to pay, unfortunately. I finally went up to one of the helpers and asked them to do the Pyrex stuff next, because we needed to get back home to the kids. I figured we would have been home by 4 and it was already 5!! 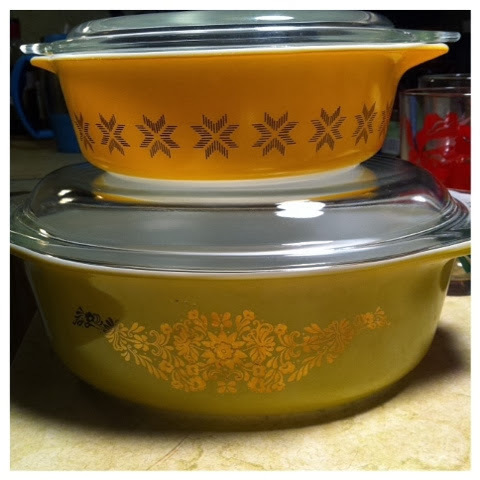 Thankfully, the guy was happy to do so and after 5 hours at the auction, all we came home with was the two Pyrex dishes below. I'm happy with them. They are in pristine condition and I paid far less than if I had gotten them online or even at my local thrift stores. I don't think we'll go to a consignment auction again, now that we know what we know now. I'll stick to estate auctions, but hey, I got my fix and something to show for it, right?! In other news, I've been selling things on my Instagram account, @516vintage and I am doing really well there. So well in fact, I am making more than I make in the booth! At this rate, keeping the booth is making less and less sense so I put up 20% sale signs in the booth the last time I went in to restock and hopefully I can clear out at least half of it and then close it out at the end of February. The booth was fun, and I don't regret it. Now I know what it takes and I can say I've done it and no more wondering about it. Time to move on and pursue other avenues! Feel free to check out my Instagram shop and if there;s something you like, you can purchase it via paypal. Or just come by and say "hi!" I post pictures of other things besides sale stuff, so it's not all about selling things. Happy 2014 to you, and here's hoping it will be a good year for us all! We took Miss Kitty to a no-kill shelter today. Not too happy about it, but it needed to be done. Of all of us, Evelyn feels the most sad about it because Miss Kitty was sort of hers. Miss Kitty liked to sit on her lap and slept on her bed and I always told Evelyn that when she moved out, if Miss Kitty was still around, she had to take her with her. Let's be honest, it's not my favorite thing as a parent, to take away something the kids love, but for the past... year? Ages it seems like, one of the cats (there are 5 in the house) has pooped outside of the litter box and everyday Andrew or I have to clean up the poop. This gets old, really fast. We got a new couch last year, a nice leather one, and about a month after we got it, one of the cats peed on it. 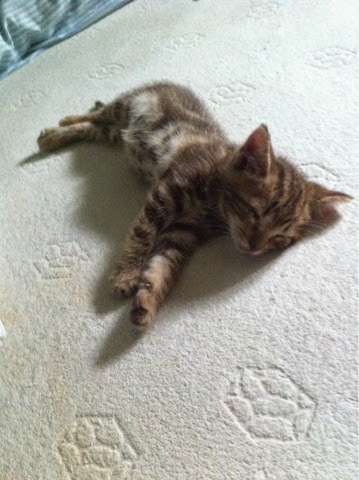 If you have cats, you know how strongly cat urine smells and no amount of cleaner or spray can completely eradicate it. I was so upset, the pee was on the part of the couch where I usually sat and every time I sat there, I could smell the pee which made it miserable for me. The problem was, we didn't know which cat it was, so we had to wait and wait until we could catch the cat in the act. We finally caught the culprit, and it was Miss Kitty. un-spayed female had to go to a shelter. It has been a rule we've kept since we moved here more than 8 years ago. I love cats, and I accept the cat hair and the litter box chore, and the occasional hair ball on the bed, but I cannot love the smell of cat pee on the furniture or in the house, so Miss Kitty had to go. If it was summer, I'd throw her outside and she can join the other outside cats, but there's a blanket of snow out there and that would just be cruel to take a spoiled housecat and toss her in the snow. So to a big no-kill shelter she went. It's a nice shelter and I'm sure someone will fall in love with her and give her a home. We were gone from the house for 5 hours and I have to tell you, it was nice not to find poop outside of the litter box when we got back. About the couch-- I recently found a recipe for a spray that is supposed to work wonders on dog and cat urine, so I mixed it up and tried it out last night and as of this morning, I don't smell any pee. I vacuumed the couch, and pretty much doused the bottom where the cushions go and the cushions themselves. It was all dry by morning and I no longer smell anything but the spray on the couch, but the cushions could use another spray, which to me is understandable, the foam in there probably absorbed the pee﻿. Tonight, I'm going to flip the couch over and spray the underside and the cushions again. I hope the spray works, because the couch is still in good shape and I'd like to keep it for as long as I can. I made it out to the booth today. I admit, it had been a little too long between visits but with the SUV in the shop for over a week and then my sprained ankle, it was just a little bit difficult to get out there. I knew I had to go soon, because of the coming Holidays and I had put aside quite a bit of merchandise just for this time of year. A sort of "Before" picture. 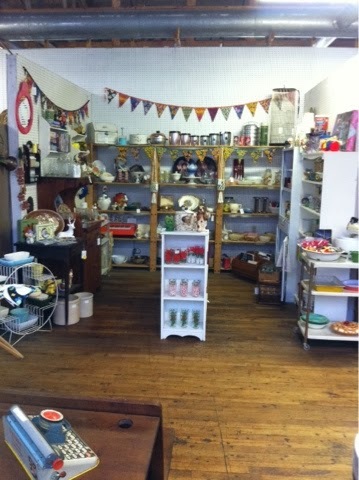 I brought in 6 boxes and some more shelving to make more room for displaying the goods. The big shelves in back are looking bare and sales have been sluggish, so I hope all the fresh merchandise will get things moving! I moved one of the shelves I had on the side into the middle and a new slim shelf is in front of it. 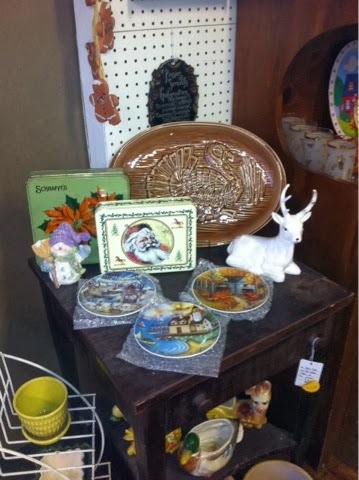 Customers now go in and around and there's more to look at with the center shelves. 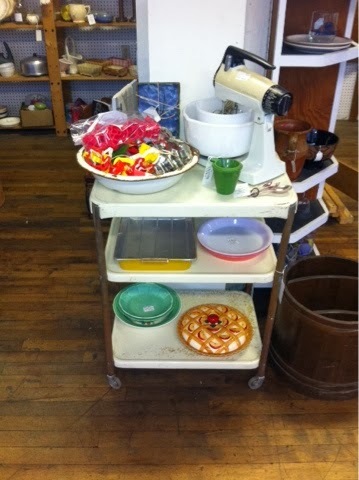 A little rolling cart replaces the shelf I had there and I made it into my baking section with all the vintage bake ware, cookie cutters, and the vintage Sunbeam stand mixer. Close up shot of the new slim shelf. 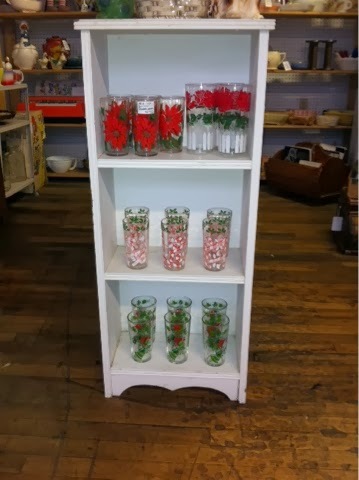 A few of my vintage Holiday glasses. I'm such a glass hoarder, it was super hard to give these up! I tried to give them room to shine and not crowd them with other things, and if a set sells, the staff at the mall are really great at moving things around to fill up your empty spaces. Here's where the shelf I moved ended up, right behind the slim shelf. I like it here much better. 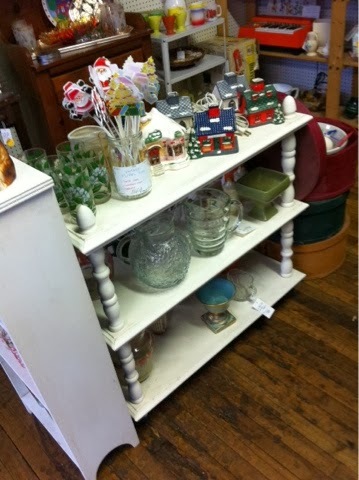 I was in a hurry and didn't really get to arrange the bottom shelf the way I wanted to-- the place was busy and I wanted to quickly get out of there before I lost any sales to potential customers. A little table display on the left side of the booth. I like how this turned out. I came back home with about half a box of stuff because I just ran out of time and I couldn't find a place to put some of those things on display. I have a small wire Christmas tree that I cannot find and I wanted to use it to display and sell ornaments. I thought I could do without the tree and just leave them in a bowl, but it didn't look right to me, so they came back home with me. I've made a promise to myself to get back out to the booth after the weekend and add a few more items and meanwhile, find that tree!! Find Me @516Vintage on Instagram! What you see is what you get. I make no apologies for who I am and the way I choose to live my life. I'm Deaf, a wife and a mom. This blog is about me, my life and my family. I write about whatever strikes my fancy, whether it be about my kids, my latest craft project, something I made in the kitchen, or a mindless rant (it happens!). If you like what you see, pull up a chair and stay a while. I'm tickled when you leave a comment and I try to respond to all of them, but once in a while, time escapes me and I don't get around to responding to them all-- I have 4 kids, they keep me hopping! What Does Mom Really Stand For?